One of the interesting things about my quest to get in better shape has been in the type of foods I eat. Right now I follow a carb-cycle diet. For most of the week I eat high-protein/low-carb and don’t worry about the fat intake. One day a week I let loose and ingest carbohydrates – usually clean foods if I can. I will go into the detailed reasoning behind this in a later post, but being strict on the macro-nutrients I consume helped me learn a lot about different foods and also made me really efficient at reading food nutrition labels – a skill everyone should learn. One of the things I started to notice was that low-fat foods were often a vessel for lots of nasty sugar, or even worse high fructose corn syrup (HFCS). Vitamins A and E, required for a healthy immune system among other things, are fat soluble. Low fat diets therefore reduce A and E absorption. Fat is required to get an appropriate intake of essential fatty acids. Our body cannot produce Omega-3 and Omega-6 fatty acids so its vital we get them from diet. A meal containing fat suppresses hunger more readily, making it less necessary to snack or overeat. It is important to note that if sugar is NOT used as energy (i.e. you are living with a calorie surplus) then it will be stored on your body as fat just as readily as any other calorie providing macronutrient. And don’t think a low-sugar variant is necessarily better. Studies show that people eating foods high in artificial sweeteners typically eat up to 50% more food overall – and that doesn’t even consider other really bad side effects. This link has some great points. Still not so sure about how bad sugar can be? Look here as well. It has also been shown that saturated fat or cholesterol rich foods are NOT directly linked to an increase in coronary heart disease. I rarely eat light cheese, fake butter or other fake versions of real products – I have a suspicion for food with unnatural ingredients. The upside is that I rarely get moments where I need to snack outside of planned meals/snacks. My workouts are well fuelled, and I rarely feel tired for dietary reasons. Also most of my food is natural. One example is Salad Dressing. 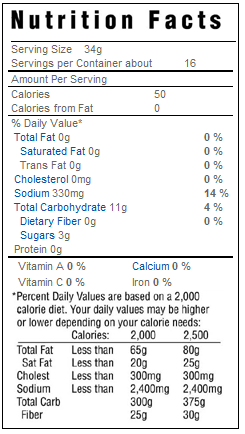 Look at the nutrition labels for Krafts Ranch and Fat Free Ranch. Looking just at the calories alone, of course the full fat version looks a little worse off. However looking at the ingredient list where two of the top 4 ingredients are corn syrup, and the total carb count is high tells me to avoid this product (and to be honest I avoid ranch dressing anyway). Ingredients: WATER, SOYBEAN OIL, SUGAR, GARLIC JUICE, BUTTERMILK, CONTAINS LESS THAN 2% OF SALT, MODIFIED FOOD STARCH, WHEY, PHOSPHORIC ACID, MONOSODIUM GLUTAMATE, EGG WHITES, VINEGAR, XANTHAN GUM, CITRIC ACID, POLYSORBATE 60, SPICE, NATURAL FLAVOR, ENZYMES, WITH SODIUM LACTATE, NATAMYCIN, AND CALCIUM DISODIUM EDTA AS PRESERVATIVES. By always reading the nutrition labels I know what goes into my body. Sometimes I choose to eat something that contains a lot of sugar or other “crap” but its always a conscious choice. As a final anecdote, I saw an advert for the new “low-fat” granola” from Kellog’s. 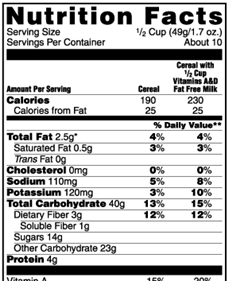 If you look at the front of the packet and see the words low-fat and granola, you think “must be healthy, right?”. WRONG!!! Look at the ingredients and all that sugar. 3 spoonfuls of sugar for breakfast? No thank you! Ingredients: WHOLE OATS, WHOLE GRAIN WHEAT, SUGAR, CORN SYRUP, RICE, ALMONDS, MOLASSES, MODIFIED CORN STARCH, HIGH FRUCTOSE CORN SYRUP, PALM OIL, SALT, CINNAMON, NONFAT DRY MILK, NATURAL AND ARTIFICIAL FLAVOR, POLYGLYCEROL ESTERS OF MONO- AND DIGLYCERIDES, MALT FLAVOR, NIACINAMIDE, ZINC OXIDE, ASCORBIC ACID (VITAMIN C), PYRIDOXINE HYDROCHLORIDE (VITAMIN B6), REDUCED IRON, GUAR GUM, BHT (PRESERVATIVE), RIBOFLAVIN (VITAMIN B2), VITAMIN A PALMITATE, FOLIC ACID, THIAMIN HYDROCHLORIDE (VITAMIN B1), VITAMIN B12 AND VITAMIN D.